Ustad Sarahang (1924-1983) is perhaps the best known exponent of hindustani classical music from Kabul (Afghanistan). Ustad Mohammad Hussain Sarahang was born in 1924 the second oldest son of the renowned musician, Ustad Gholam Hussain. Mohammad Hussain was born and raised in Kharabat (old Kabul), a city famous and conceivably notorious for its musicians. Ustad Mohammad Hussain Sarahang began taking music lessons in his early ages from his father while attending school. Within a short of time, Mohammad Hussain mastered the theory of classical music and showed a keen interest for more knowledge. His proud father sent his teenage son to Patiala School of Music in India to be student of Ustad Ashiq Ali Khan ‘The Light of Punjab’. Ustad Mohammad Hussain Sarahang, after 16 years of service and learning, returned to his beloved Kabul. At the age of 25, Ustad Mohammad Hussain Sarahang participated in a festival of music held at Kabuls famed Pamir Cinema. Amongst the participants were Ustad Qasim and Ustad Bade Ghulam Ali Khan. 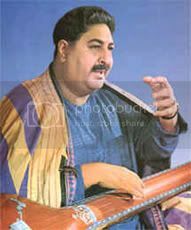 At this festival, Ustad Mohammad Hussain Sarahang amazed the crowd with his talent and passion and was awarded the Gold Medal over the more famous Masters of music. His performance at this festival earned him the title of Ustad and a few years later, the government of Afghanistan awarded him the title of In Afghanistan, Ustad Sarahang worked hard to educate the public about classical music, which originated in Afghanistan centuries ago by Nasir Khesrow. Ustad Sarahang wrote many articles in Pashtun Ghag newspaper, he wrote a book titled Qanon e Tarab explaining the rules of eastern music. He and Maddadi hosted 2 nightly informative radio programs entitled De Ahangoono Mahfil comprised of poetry reading and ghazal songs and Mosiqi Kilasik introducing classical raags to the public. Ustad preferred the poetry of Abdul Qader Baydel, the complicated yet elegant poet of the Moghol dynasty. Ustad Sarahang was a member of the elite group of Baydel Shenasan who discussed and interpreted the verses of Baydels poetry in gatherings at local tea-houses. Amongst these circles of thinkers was Qandi Agha who had the most influence and was a great friend of Ustad Sarahang. In India, Ustad Sarahang was an idol to be worshipped. During his last trip to Allahabad School of Music, in order to show respect for the great Ustad Sarahang, Indian female ‘Ustads’ and students of the school lined up and bowed their heads furnishing the path to the stage with their hair so that Ustad Sarahang could walk over them. His medal count reached 20, a status earned by fewer than a handful of musicians in the world, and by far the youngest musician to earn so many titles and medals. Ustad Sarahang once said that if he were to die in India, he was to be buried next to the tomb of Baydel, but if he were to die in Afghanistan, he requested to be buried in Kharabat. Upon his last trip to India in 1982, Ustad Sarahang fell gravely ill and was hospitalized and ordered not to sing and to keep his talking to a minimum. But Ustad Sarahang disregarded the orders of his doctors and continued his performance which earned him yet another medal and with it the pride to the people of Afghanistan. Ustad Sarahang seemed weak and ill upon his return to Afghanistan, but he continued to write and teach music. In 1983, Ustad Sarahang suffered yet another heart attack that hospitalized him. Growing ever weaker, Ustad Sarahang passed away on a clear Saturday morning in April of that year. Find more music of Ustad Sarahang in my Hindustani Classical Music II folder at eSnips. Problems galore persist at eSnips. The whole of December has passed away with users facing one problem or the other, many facing the dilemma of whether to move away from eSnips and search for greener pastures. A recent happening at eSnips : users’ files are dying a slow death the ‘poison’ still being unknown. Everyday friends at eSnips are reporting that files are being removed or blocked indiscriminately without any logic or reason given. Suppose I have uploaded a full album of an artist, I find only a couple of the songs being removed or blocked, whereas others are playing as before. So there are are no copyright issues I suppose. eSnips should inform individuals and point out the files which are a cause of concern to them. Let users remove the files themselves or take the risk of their accounts being banned or cancelled. One more discovery I have made (eSnips is proving itself to be an interesting maze puzzle, at the cost of being laughed at later on), if your file is still showing in your folders and only gives an error when you attempt to play it, you can still salvage it. Just move such files to any of your private folders and you will find that they are still there, playing as before but better be quick in doing this and don’t share them for the time being. I for myself am worried because my music files belong to a dying genre of music and is going through a ‘renaissance’ period. Today’s younger generation is being drawn towards it after a gap of almost 50 years. The whole of 60’s, 70’s, 80’s and 90’s were the decades when Hindi film music ruled the roost and hindustani classical music was a word alien to the younger generation. Some of the artists which I have featured are no more in this world and let me say no longer remembered (no copyright issues here atleast). Many others are very young and are quite happy to find their music doing the rounds on the internet. In fact some of them have even contacted me personally and showed their pleasure after knowing that their music is being lapped up (read loved) by the new generation of hindustani classical music lovers. (must admit I spent quite a few sleepless nights until I finished upon it… ) but many of my visitors failed to notice it and continued to pay their attention only on the tips & tricks of downloading at eSnips. This eSnips Downloader is the easiest thing to use…no install required or anything of that sort. Just a click of the mouse and you are done. As I am not a techie or a software professional, I have tried my best to make it simple and easy to use. A few of you who have been complaining their music opening up in a player instead of dowloading will find this very useful because I have added an extra piece of code forcing the file to download and not play. A very happy New Year to all of you. Enjoy !! Since yesterday I have been flooded with queries about the missing ‘download‘ button and an easy way to dupe eSnips into letting all users to download mp3 files freely. I posted a few tips & tricks to download music files, button or no button. After posting these tips I was still uncertain whether all users would go as far as searching the Cache of Internet Explorer or even downloading Flashget and follow the instructions given in the post. As most of us are not techies or for that matter even computer savvy, I pursued in my quest to find an easier way out and make things easier for fellow eSnippers. At last I discovered a big security lapse at the eSnips server. Now just press Enter. Lo and behold your file is ready for download. No need for downloading Flashget or searching fervently for your needed file in the ever bloated Internet Explorer Cache. This window will inadvertently remind you of the good-old-days of the green download button and may drive you to nostalgia. Just click on Save and watch your mp3 being downloaded as before. Good old downloading days are here again …. till eSnips catches up with this too. 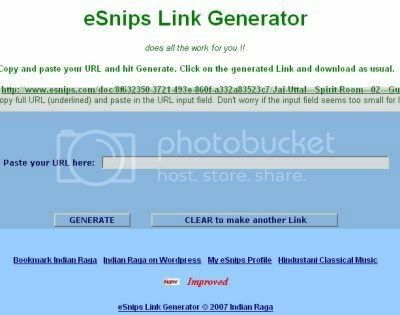 From Dec 1, 2007, eSnips, which was fast gaining popularity among music communities because it offered huge 5 GB of storage space for free and allowed users to download mp3 files from each other, has now removed it’s now famous green ‘Download’ button. As of now, one can only listen to a streaming mp3 but would not be able to download it. But there’s still hope unless someone from eSnips catches with it. Although eSnips has given an option to all those who upload mp3 files, if or not they want to share their music with other eSnippers, through the ‘edit details’ settings, but this was not working till yesterday, atleast not with files which were uploaded before 1st Dec 2007. For those of you who download a few files and are not into bulk downloads its not a big problem. Play the file you want till the end. Open your windows explorer > documents and settings > user folder (computer user’s name) > local settings > temporary internet files. You will find your wanted file in the Internet Explorer cache, though with a different name something like this : ?id=1196684437204 : you can detect the file by its icon (winamp or any other mp3 program icon) and filesize. Copy the file to the folder of your choice and rename it to it’s original name. A piece of advice before you venture out to follow this tip: Delete all the Temporary Internet Files of Internet Explorer completely. You may do this by clicking on Tools option of the Internet Explorer > Internet Options > Temporary Internet Files > Delete Files. After clearing the files it would be lot easier for you to find that saved file otherwise finding a particular file from the Cache could be as hectic as finding a pin in a haystack. After installing Flashget normally, start it and minimize it. It will be visible in your system tray though. There must be a …../?id=(numbers) part in the location of the file. As you copy the Location by selecting it with the mouse and right clicking on it and then copying, Flashget will automatically copy that URL in its window and you just have to click on the OK button and start downloading this file. If the window does not open by itself, maximize Flashget, click Edit option on the menu, select Paste URL. A window will open and your copied url will be already there, you just have to click on the OK button. It is not necessary to play the full eSnips file. You play it for a few seconds, copy the file Location (URL) and start playing another music file and repeating the same. 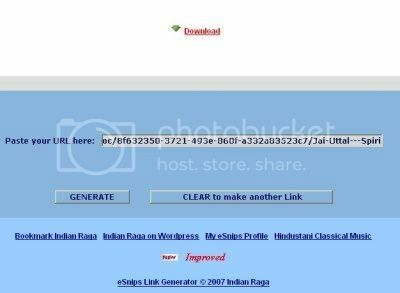 This way you may copy the download URLs of multiple files and download them later at your convenience. However there is a glitch here. The eSnips server does not have ‘resume’ capability for file downloads. So you have to download each file in one go without interrupting i.e. without stopping or pausing. However if your internet connection breaks or you have paused the download by mistake, you’ll have to start allover again. I hope these small download tips will bring smiles on all those eSnippers who thought that the world has come to an end after eSnips removed the ‘download‘ button. Keep smiling and download as much as you can …. till eSnips people catch up with this.